WIN this Christmas with PizzaExpress! 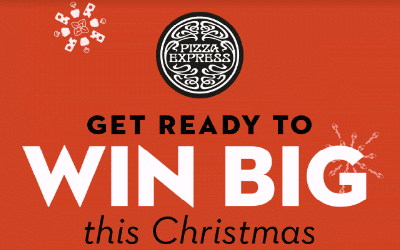 Win something big at PizzaExpress this Christmas. It’s starting to feel a bit like Christmas. The cold weather is moving in, and days are getting shorter and shorter. The festive lights will soon illuminate the streets, and the seasonal songs will start playing before we know it. It’s the most wonderful time of the year and is renowned for giving something special! PizzaExpress have truly embraced the festivities this year with a fantastic competition with plenty of prizes to be won, including holidays, hampers and of course, pizza. If you feel like embracing the Christmas spirit sign up to the PizzaExpress family before 28 October for a chance to win! There will be 2 chances to win every week from 24 November to 22 December. To be in with a chance to win this Christmas, click here.